There is little awareness of younger onset dementia. Many people with younger onset dementia, as well as their families and carers, are currently not receiving appropriate support. While everyone affected by dementia wants timely, quality and accessible services that meet their individual needs, there are unique and complex issues faced by people with younger onset dementia and their family carers which are currently not being addressed. More than 100 people attended the Summit on 22-24 February 2009. The Summit involved primarily people with younger onset dementia, carers from all states and territories and also key partners1working with people with younger onset dementia. Improve the lives of people with younger onset dementia and their families and carers. Identify consumer priorities for future improvements in services and resources for people with younger onset dementia. 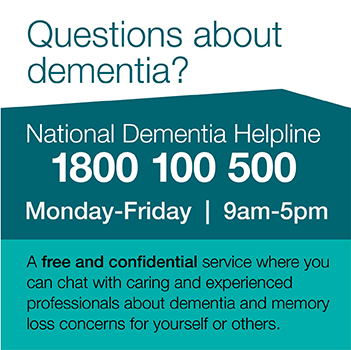 Bring to the Federal and State/Territory Governments’ attention the reality that services for people with dementia are not meeting the needs of people with younger onset dementia. Identify ways to improve social inclusion of people with younger onset dementia, their families and carers. Promote awareness of younger onset dementia in the community. This communiqué and supporting recommendations address how the quality of life can be maintained and improved for people with younger onset dementia, their families and carers. This document contains a program of the summit, a transcript of all of the summit speeches and presentations and other key information. This paper has been developed from the 2006 consultation report Exploring the Needs of Younger People with Dementia in Australia with additional contributions from consumers and staff across Australia. Dementia Australia invited AIDS Dementia and HIV Psychiatry Service, Alcohol Related Brain Injury Australian Services (ARBIAS), Down Syndrome NSW, Huntington’s Disease Australia, National Stroke Foundation, Motor Neurone Disease Australia, Multiple Sclerosis Australia – ACT/NSW/Vic, Parkinson’s Australia and Young People in Nursing Homes National Alliance to the Summit.